Are you ready for your Year 11 Biology Yearly Exam? Assess your exam-readiness with these commonly asked exam questions. We have listed below some of the most popular exam questions for your quick reference. You can download the free Matrix Year 11 Biology Practice Paper at the bottom of this article. Which of the following organelles in a eukaryote cell are correctly matched with their function? What does the diagram depict? Liver contains an enzyme called catalase. This enzyme acts on the substrate hydrogen peroxide to produce water and oxygen gas. Given the information above, design a first-hand investigation to determine the effect of temperature on enzyme activity. A veterinarian was presented with a badly damaged roadkill and asked to identify whether it was a carnivorous tiger quoll or an herbivorous ringtail possum. How might the vet identify the animal through dissection? (A) A ringtail possum will have a short simple digestive system compared to the quoll. (B) A ringtail possum will have a stomach, but a tiger quoll will not. (C) A ringtail possum will have a caecum, but a tiger quoll will not. (D) A ringtail possum will have an appendix, but a tiger quoll will not. Outline the current theory for the movement of materials in xylem tissue. Koalas have a low metabolic rate that allows them to digest food for long enough to extract energy from their high fibre diet. As a result, koalas may sleep for more than 20 hours per day. How should this ability be described? New Zealand does not have any native mammals. However, a small flightless ratite bird, the Kiwi, has a similar appearance and habitat to small insectivorous mammals. It has plain brown feathers, lives in a burrow and has long thin feathers near its beak which act like whiskers. Explain how a bird and a mammal could end up with similar characteristics. The rate of infections by antibiotic-resistant bacteria has been increasing since antibiotics were first introduced. The Tasmanian tiger or thylacine represents an example of an extinction of an Australian mammal species. What is the most likely cause of the extinction of the thylacine? (A) The activity of early Australians in managing areas of land with fire. (B) Hunting since European settlement. (C) The natural decline in global biodiversity. (D) The change from cool and wet conditions to hot and arid on mainland Australia. Native palm trees and other rainforest type plants are found around a number of waterholes in the dry centre of Australia. Which one of the following explanation for this would best fit our knowledge of Australia’s ecosystems? (a) The plants must have been transported unwittingly by animals travelling from waterhole to waterhole, probably by seeds in their dung. (b) They evolved from local desert plants. (c) They are remnants of a more widespread rainforest vegetation which once covered the whole area. (d) They are early evidence of climate change – global warming is increasing rainfall in the centre of Australia. 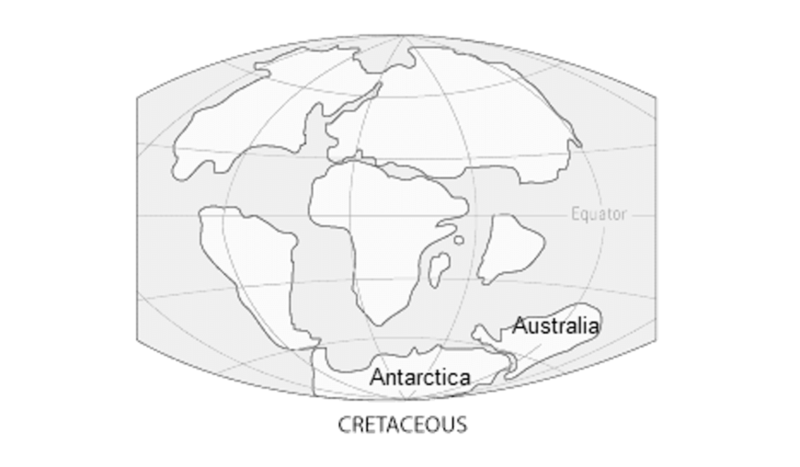 The following diagram illustrates the relative positions of Australia and Antarctica during the Cretaceous period. Which of the following statements about Australia’s past is correct? (A) As Australia drifted north, glaciers began to form in Australia’s interior. (B) As Australia drifted north, its overall climate became hotter and more arid. (C) As Australia drifted north, individuals began to adapt to the change in climate. Are your ready for your upcoming Year 11 Biology Yearly Exam? Test your depth of knowledge and understanding with our 2-hour Year 11 Biology Yearly Exam Practice Paper. Click here to download the Matrix Year 11 Biology Practice Paper. The Matrix Science Team are teachers and tutors with a passion for Science and a dedication to seeing Matrix Students achieving their academic goals.